Your name should be in the upper left corner so it’s the first thing they read. Making it big and noticeable also helps the person you’re talking to remember your name in case they forget, which they probably will. Your position or title within your company or organization. I put CEO on my first set of business cards. Looking back, calling myself a CEO was awfully pretentious considering I was the only person in my company. Those three letters, however, made an impact on people and caused them to take me more seriously. I think Founder, Owner, Business Owner, Project Manager, and General Manager are more appropriate positions for freelancers and small business owners. Update: Since publishing this post, I co-founded a simple freelance marketplace called AwesomeWeb. If you’re a freelance web designer or developer and you need more clients, find out more and sign up here. Email (required) – Most business is done through email. It’s more credible if you have an email address attached to your domain (i.e. nick@14clicks.com). Phone (recommended) – If you have a local business with older clientele, they’ll want to reach you by phone. If you don’t want to list your personal phone number, get a business phone number. Website (recommended) – If you have a website, every piece of marketing material you create should be intended to get them to your site. It’s a salesperson that works 24/7. Fax – Maybe if you’re running a professional-type business or if your clients are dinosaurs. Skype – A friend of mine met a kid from Nigeria who put his Skype ID on his business card. For international business, your Skype is more relevant than your phone number. LinkedIn, Twitter, Facebook, etc. – Include social links if you don’t have a website. But if you do, send them to your website to find these links. Advertising and social media is intended to get people to your website, not the other way around. Physical Address – If you’re running your business out of an office, list your address so people can send you things and find your place of business for meetings. If you’re running it out of your home, just include the town. By including your town, locals will know that you’re local and non-locals can bring up your hometown as a talking point. I chose to include phone number, email, town, and website in that order. Always include a headshot on your business card. As I mentioned earlier, I have hundreds of business cards. I don’t remember meeting 90% of these people. But if there’s a photo of their face, I can usually recall meeting that person and at least a snippet of our conversation. The purpose of a business card is to help people connect with you. If they don’t even remember you, your card is pointless. Also, when you leave your card with other people to pass out to their network, the people they give the card to will want to know what you look like. Your business card is a marketing tool. All marketing tools should consistently represent your brand colors and logo. Therefore, use your company colors and put your logo on your card. If you handed your business card to someone at a networking event where there are hundreds of other people handing out business cards, that person will probably forget what you do unless it’s listed on your card. If you provide a service, list the services you provide. If you sell products, list the names of your top products. You can also represent what you do with a tagline, mantra, or mission statement. vCard/Contact Information – You can embed your name, email, phone number, company name, etc. into a QR code so someone just has to scan the code to add you as a contact in their phone. URL – You can send them to a mobile friendly landing page. The nice thing about this option is that you can update the landing page if you decide to change the message. RSS Feed – If you’re a blogger, you can embed a link to your RSS feed so they can scan your code to read your latest blog posts. Google Map – If you have an office or physical location, this’ll come in handy if they get lost trying to find your place. YouTube Video – You can make a private YouTube video thanking them for talking with you or providing an exclusive tip. I chose to send them to a mobile landing page because I like the flexibility of being able to update it to whatever I want. Make free QR codes with QR Stuff for small QR codes or Delivr if you need a larger HD code for posters and big things. 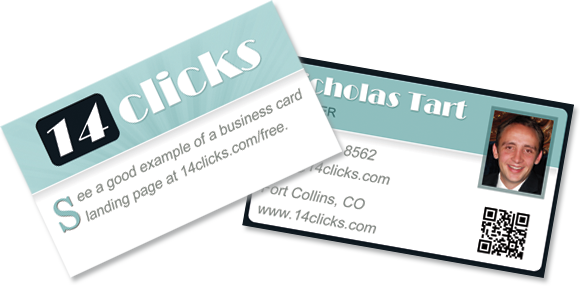 Just like any good marketing material, your business card should have a clever call-to-action. Make it relevant and mysterious to make them curious enough to actually follow through. I put, “See a good example of a business card landing page at 14clicks.com/free.” on the back of my cards. People like to write notes on the back of the card to remind them of who you are and what you talked about. Leave non-glossy whitespace on the back of the cards so they can use a pen to leave a note. I used GotPrint for my business cards. They price-match any comparable business card, offer high quality, and I received my cards (and letterhead) within a week. So what do you think? Did I teach you something you didn’t know about business cards? Let me know in the comments..
Great article Nick! I look forward to the weekly insight. I’m going to send a “purple dinosaur” to come and kick you! Thanks Reed! Haha… I’m not sure why “kitty kick” was the first thing that came to mind for bullet. I’m going to say it was purely for the alliteration. I also recommend vistaprint for business cards. you can get 250,free if you pay the shipping. I got my first 500 cards from Vistaprint because of that deal. They charge you to remove their logo from the back (otherwise you’re promoting their company and you seem cheap). They charge you to add content to the back. And they charge you to upload a custom design. 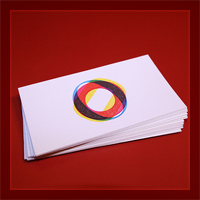 If you want legitimate business cards, GotPrint is the better deal and they use higher quality paper. Yeah, it’s ingenious on the surface, but I think they’ll always be stuck as the Walmart of printing services. But that’s ok; Walmart is doing alright. Am looking forward to know more but truly amazing and inspiring as to what you are doing. Thank you, Abdillah! I’m glad I could inspire you. What questions do you have about entrepreneurship? What would you like to do? I just realized how grateful I am for the things that I have and the place that I live. Thank you, Abdillah. I wish there was something I could do. How are other entrepreneurs succeeding in Kenya? Well, there are some ‘selective’ few who do succeed, after lots of hardship. Imagine of a case where one presents over ideas to an initiative with the hope of being funded, request is denied.. then your brilliant idea gets “stolen” and given to some other individual. OH MY GOSH! Steve Jobs is dead. A moment of silence………………………..
…It reminded me when I found out about Steve Irwin passing away. I thought that guy was invincible. Holy cow. You don’t know who Steve Irwin was, do you? i ‘m gonna search him on yahoo right now okay? actually that …………. was a moment of silence. what a min. i know him he’s the croc fighter guy right. he died from a stingray. man how could i forget him? Thank goodness. Steve Irwin was an icon of my teenage years. I didn’t think I was that old. when i was younger i watched this tv show about his Bindi. I couldn’t imagine a business without a business card. But with all these business card tips, I can actually create the business card myself. You’re tips are really awesome. Thanks for the share. You’re welcome, John! I always enjoy your comments. My goal with every post is to make it an ultimate resource for some small topic. Thank you for mentioning and recommending us in your post. Great article! We look forward to doing more business with you in the near future. You deserve it, GotPrint! I’m very pleased with my cards and letterhead. I’ll recommend y’all over VP anyday, even with their affiliate program.